Several Circuses are coming to Geneva for few weeks every year to perform their outstanding performances. 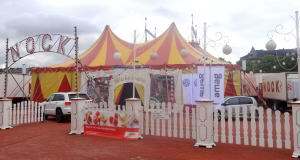 The most popular are: Cirque du Soleil, Knie Circus, Cirque de Noel and Circus Nock. The circus usually takes place at Plaine de Plainpalais. As every year the family Knie is presenting their new program with a lot of animals, top level artistis and clownish performances. Circus Knie is popular circus with almost 100 years history is touring Switzerland every year and visiting Geneva for 3 weeks. Apart from show itself, the ZOO is available to meet with the animals. Circus Nock is traditional circus traveling around Switzerland, stopping also in Geneva for duration of about 2 weeks. In about 2h15m long performance, you can see shows with animals, athletic shows and performances enriched by comedy intermezzos. Ticket costs: from 20-60 CHF for age 12 and more and 12-41 CHF for age 3-11. Prices vary depending on sector in the audience.